Model T Ford Forum: Car shocks me and won't start. Car shocks me and won't start. Model T Ford Forum: Forum 2014: Car shocks me and won't start. I had my T running and driving and then I threw a tart over it for two weeks while I waited for new coils. I got my new coils and put them in, instead of starting up I got shocked by the key. Where should I look to trouble shoot it? Anybody have any guesses as to what would cause this? The key is connected to the bottom of the coil box. There is one long buss which contacts all the coils. If you run on battery, that buss is energized when you turn on the key. If you are running on magneto, that buss is energized when the engine is turning over with the key on. 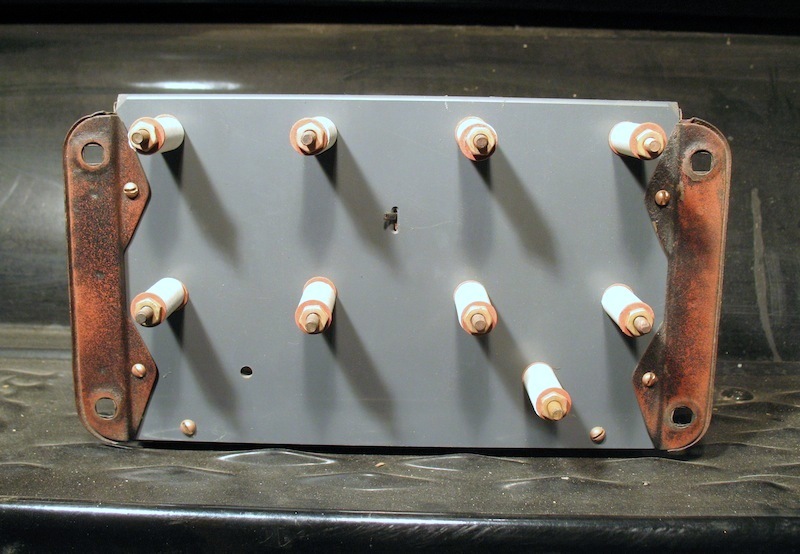 The lower contacts of the coils are each one connected to a corresponding spark plug, and the upper contact on the coil is connected to a wire going to the timer. 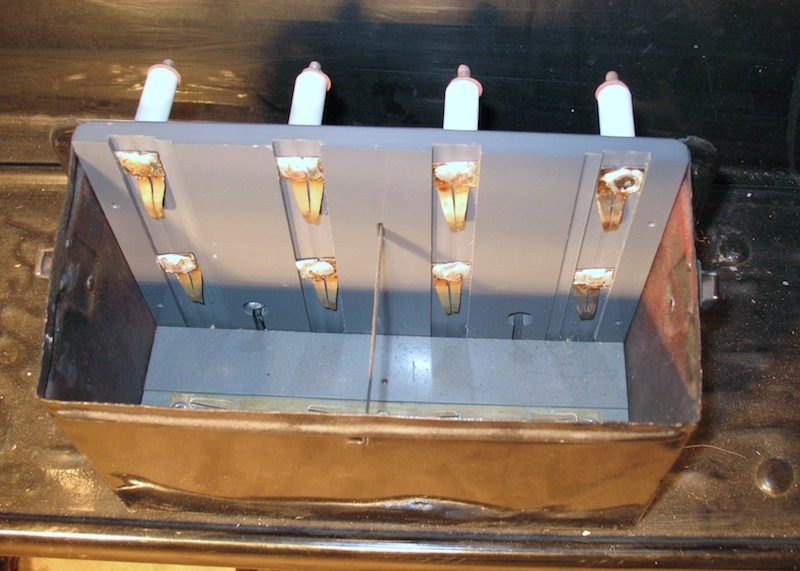 The only way you could get shocked by the key, would be if there was some connection between the lower contact and the buss at the bottom of the coil box. I would suspect that you might have an internal short in one of the coils. Do you have your old coils? If you do, try substituting one of the old coils for one of the new coils. Keep moving it from one coil position to another until you get the engine to start. The coil you removed when you were able to start the engine would be the coil with a problem. Only other thing I can think of which could cause the problem would be a short inside the coil box, but since it ran before, and what you changed was the coils, I would suspect one of them. Note, the shock might only come with the timer in one position, so you would need to turn over the engine while making the test. If you don't have your old coils, try removing one coil at a time and turn on the key to battery and see if you still get a shock. Whichever coil you removed would be the one with the problem. If it turns out to be a problem with a coil, the person who sold you the coils should make good on it. Ok I just bought some rebuilt ones from langs. I'll figure this out before I turn in the cores. Thanks! Would that cause the car not to run? To get a shock it has to be more than the 6 or 12 volts from a battery. Also I'm assuming the only metal you were touching was the key so high tension power that's supposed to be going to the spark plugs is leaking, probably some where in the coil box, to ground or your fingers as the case may be. Check over the box and the high tension connections & plug wiring. Does it still happen with the box cover off? Could also be a coil unit problem itself. If you had a tarp over things you can get a lot of moisture trapped under it. If you don't find anything else glaring, I would suspect the coil box wood for leakage since this began with the thing covered up. Rewooding the coil box is about the only way to get rid of it but rewooding should also benefit you more than just getting rid of the shocking condition since coil box wood leakage paths are usually robbing spark energy away from the engine even when you are not there getting lit up. John isn't blowing his own horn, so I'll toot it. His Fun Projects coil box kit is an excellent investment. It eliminates coil box tracking and shorting caused by wet wood. I fully agree, I have those modern coil box kits in all of my T's. I drove thru heavy rains without any problems. Highly recommend. Easy to put in and well worth installing. Same here Steve. Got one in my '15 and really works great. Easy to install too.